This is 'secret' information in that it is not in the public domain. Generally it is information not known by competitors and is of value to the originator and owner. It will also be of value to another party who wishes to compete. It might be a trade secret providing an advantage in the market. If information is in the public arena, it will not be confidential information. This may be because there was no formal obligation on the recipient to keep such information secret. Formal signed agreements can prove valuable in enforcing confidentiality and in proving the recipient was fully aware and had agreed to keep the information confidential. The more commercially sensitive and commercially valuable the information, the more restrictions on its use and disclosures should be put in place. In support of the formal agreements businesses should put in place written procedures to keep confidential information safe. These formal procedures should include the limiting in the giving of the information to only employees or contractors who need it and those that have signed a Confidentiality Agreement. Then keeping the information in a secure environment, marking documents ‘confidential’, ensuring sensitive information is destructed professionally and ensuring the recipient is formally notified of the obligations of confidentiality. In these situations, businesses are only protected to a degree. However, the advantage of this ebook is that it enables the business owner to show that the confidential information is commercially valuable, confidential and of competitive or sensitive value. It will also ensure the recipient of the information was of the understanding there were obligations of confidentiality when the information was passed. This will put the business owner in a better position to show that there has been a breach of confidentiality by the person who received it. It is recommended that the business owner originates a system to quantify the value of any losses or harm incurred as a result of the breach. Being well prepared is critical. 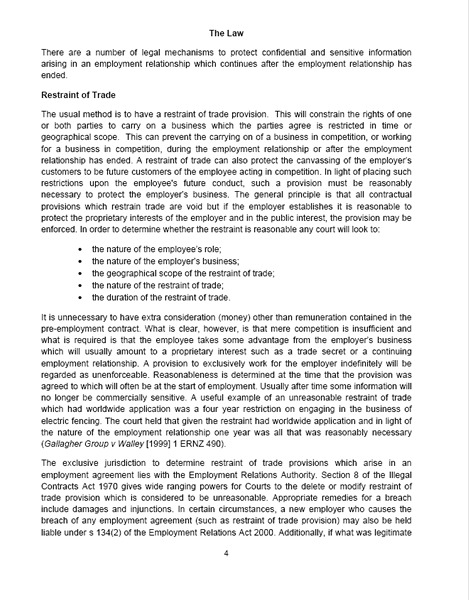 Letters of Undertaking in the situation of a Breach of Post-Employment Obligations. We recommend that these are implemented where appropriate. Business owners are well advised to identify exactly what is at risk, quantify it, and decide which positions in the business present an exposure. The clauses and agreements are not appropriate for employees who do not present an exposure or for indiscriminate use.